I saw you published your first space art in 1952. That was five years before humans ever put anything in orbit. What first got you interested in space? I was, of course, three when World War II broke out, but I was able to see the photos of V2 rockets, which looked like spaceships. 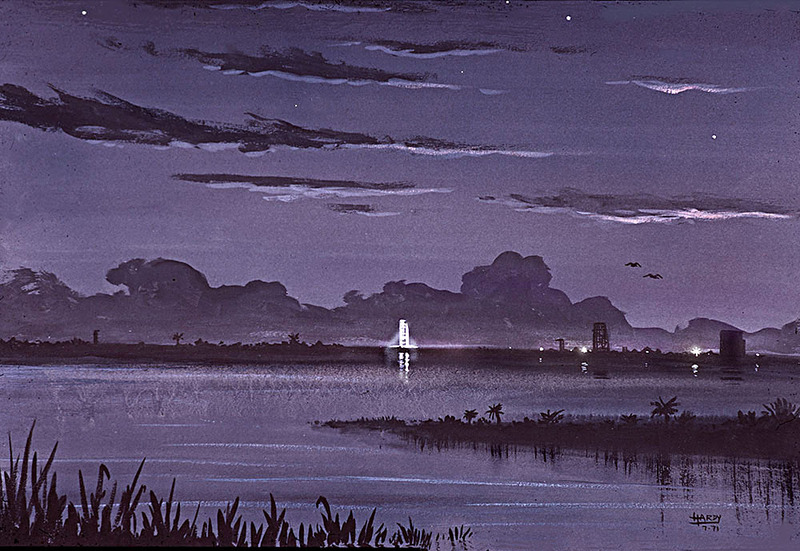 Then, after the war, illustrator Chesley Bonestell did the most wonderful art of travel to the Moon and planets in The Conquest of Space (1949) and the movie Destination Moon (1950) which I saw when I was fourteen. When my friend and I came out of the cinema and looked at the crescent Moon in the evening sky, we felt as if we had just been there! I was hooked. . . . Your artwork was first published when you were only sixteen. Was there anyone in your life that you consider vital to your art education? Why were they so important? My parents encouraged me, but my art teacher at grammar school was particularly interested, as I was painting things that no other pupil was! He even arranged an exhibition of my work at school, headed "Interplanetary Paintings by D.A. Hardy”! But it was joining the British Interplanetary Society at sixteen that really opened up possibilities, as they had a Midland Branch and asked me for paintings to put in exhibitions. They also had speakers at meetings like Arthur C. Clarke (2001: Space Odyssey) and his artist R.A.Smith. What is the role of the artist in space science? Some say science and art aren’t a natural fit. Why do we need space artists? Scientists are usually not very good at explaining their work to laypeople. In the case of astronomy and space especially, an artist is able to show things graphically in a way that makes it easier to understand — and can even make it exciting! Plus, space art is an art form in itself. My intention has always been to depict these subjects and distant objects as realistically as possible, so as to show people what it is like without being overly sensational (but being dramatic, where appropriate). At what point do you steer toward realism, and at what point doyou steer toward fiction? How do you walk that line? 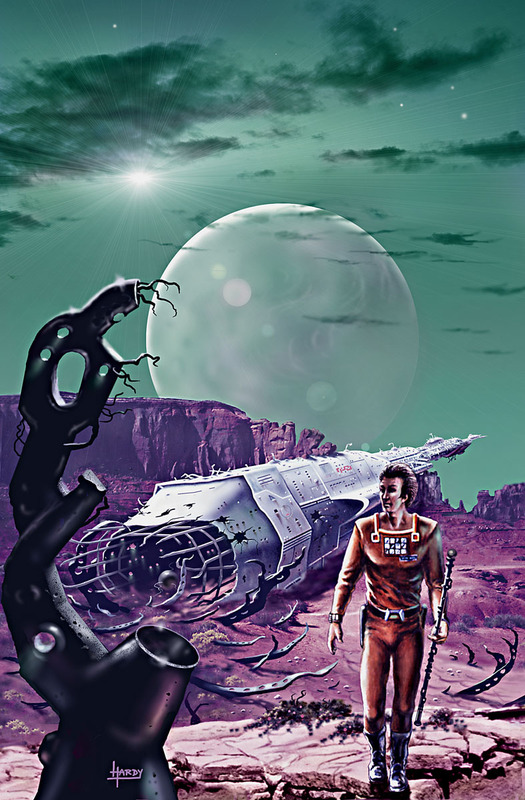 I do space/astronomical art and I do science fiction art. Although there is obviously some overlap, I try to keep these separate. Space art needs a solid knowledge of astronomy, and it helps to know some physics, chemistry, meteorology, geology, etc. too. Whereas science fiction art can use a lot more pure imagination. Personally, I never include anything that is not scientifically possible, or at least plausible. ﻿How do your landscape studies inform your paintings of other planets? What places on Earth are especially good to paint when planning a space painting? The International Association of Astronomical Artists (IAAA) holds workshops in places which we consider ‘analogues’ of other planets, and I have been to over a dozen of these since Iceland in 1988. Iceland and Yellowstone Park in the USA represent volcanic worlds like Jupiter’s moon Io, or Triton, etc., and the other places have geology similar to Mars and other worlds. 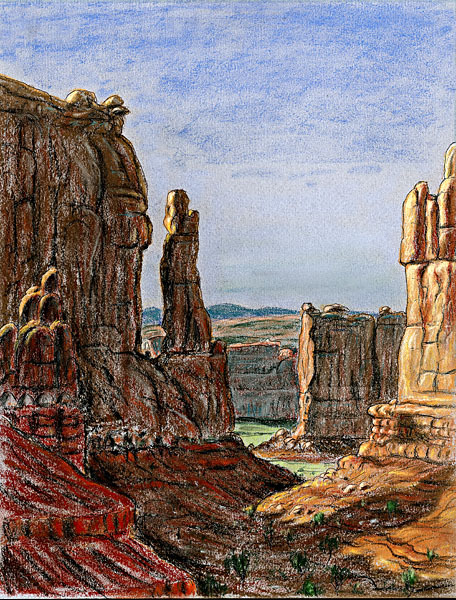 All of them enable us to paint scenery which is much more convincing and realistic than if we simply imagined it. Just today, I was looking at an artist's concept of the Kuiper Belt Object that the New Horizons spacecraft is going to fly past on January 1. It occurs to me that when you started out, that concept would have been created on paper or canvas. Did we lose anything in the transition to digital for imaging space scenes? Not necessarily, but the problem is that digital art, especially the ‘3D’ type, can all look the same and rather bland (if realistic) — there is little or no individuality, so one cannot tell who produced it unless credited. Are there any of your pieces that you think "regular people" — meaning, non-space fans — might have seen at some point in their lives? Oh, yes. For instance, when there has been some astronomical event, such as a launch, a re-entry, or the impacts of Comet Shoemaker-Levy 9 (SL-9) my impressions were shown on TV and in newspapers. You've lived through so many firsts in space. What has really stuck in your mind from an artist's perspective over these years? You cannot beat a live experience, and although many launches and other events impressed me, seeing the live launch of Apollo 15 in 1971 probably stands out best. It was the first launch that I was able to attend (or to afford the fare! ), and I was part of a party from the British Interplanetary Society. I was able to do some sketches of the Saturn 5 on the launch pad, and — afterwards — of the launch itself. The thousands of people lined up to see the launch, over a mile and a half away, the sense of expectation (and some apprehension— so much could go wrong...) And the sight and sound of the actual launch, the clouds of white steam bursting from the base of the rocket, then it was standing on a pillar of flame, at first slowly, then ascending faster and faster, until it was a dot that disappeared — but not before the first stage fell away, just visible in my cine camera’s viewfinder. But the sound was the most surprising thing. Film and TV close-ups had led us to expect a roar, something like a jet plane, but instead there was a ‘crackle’, caused — I think — by the shockwaves in the exhaust as they exceeded the speed of sound. But the sound itself was so LOUD — it washed over us and made our chests vibrate! Yes, an experience that I am so glad I never missed. If I did the math correctly, you're 82. Have you retired from art, or is it something that just kind of follows you for life? Are you working on anything these days? SpaceX plans to send a Japanese billionaire around the Moon, and he wants to bring artists along. If you were selected, would you go? What would you paint?